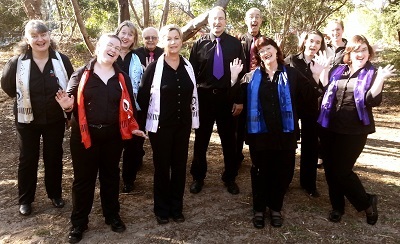 Adelaide Allsorts was formed in 2010 when a mixed barbershop quartet 3 Tarts & a DIVA! Consisting of Andrew & Sarah Bradley and David & Linda Vinall decided to expand and create a new chorus for Adelaide and its surrounds. Using the experience gained in blending male and female voices in close harmony. Initially meeting in the City, the group slowly grew, first from members of the barbershop community and then attracting brand new members as word of this new form of barbershop spread. We moved rehearsal Venue to Marion Uniting Church in 2011 it was closer for most our members at the time and had considerably better parking! 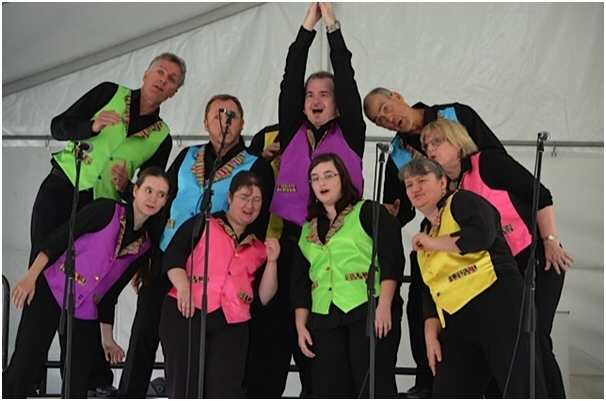 Our first Gig was singing to the crowds at Marion Celebrates in March 2011 We busked around the show stalls and had a small 20 minute set on stage in the afternoon. We went busking at Willunga Farmers Market in September 2011 sampling the local produce and entertaining the shoppers. Our next gig In November 2011 was at the Callington Show, busking for the crowds. We all had a great day meeting new people and soaking up the sun. Being part of the close knit barbershop community we were invited to sing at the Royalty Theatre as part of a joint barbershop convention between Western Australia and South Australian Clubs. 'Voices In Harmony' Became our first theatre show to a full house it showcased nearly all of the regions barbershop talent. In January 2013 Fleurieu Harmony Chorus Donated a new set of portable risers to the chorus we thank them and their skilled carpentry master Trevor Modistach for days of work and skill put in to creating them. March 2013 we were invited to sing at Marion Celebrates again with a longer stage slot where we used our new risers for the first time and lots of busking round the stalls. We entered the Barbershop Harmony Australia Central Region inaugural barbershop contest 1st June 2013. We came 3rd in the division chorus with a score of 63.8! <-not bad for a first time score. In September 2013 we entered the Vocal Australia A Cappella Championships by Video we made the finals! 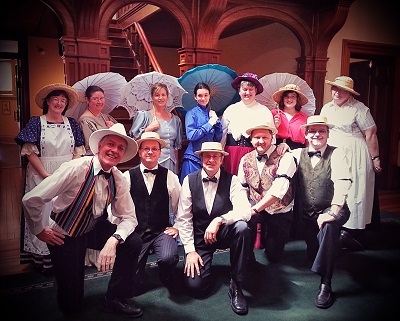 In October 2013 We got dressed up in vintage costume and sang for the Picnic Guests at Historic Urrbrae House, we had lots of fun and wowed the guests as we sang old barbershop polecats and love songs in the Billiard room and around the grounds. In December 2013 we sang at Once Upon A Market in Seaford, busking for the Christmas Shoppers and trying not to eat too many mince pies. For our last practise of 2013 we sang our favourite Christmas Carol in the Old Church taking full advantage of the wonderful acoustics. March 2014 we sang for the Lewis Masonic Lodge, we warmed up in the car park. In April 2014 we sang in a Vocal Australia State Finals in Elder Hall Adelaide Great singing by everyone Festival Statesmen and Now In Stereo won the lot, well deserved too! 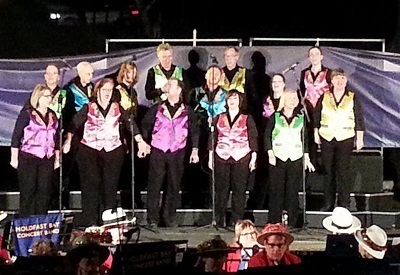 In June 2014 we came 4th in the Small Chorus Division of the Adelaide Eistedfodd. July 2014 We changed our rehearsal venue to the Corner in Warradale, much nicer to sing in with Air Conditioning a kitchen and lots of rooms to have sectionals in! Great Performance Hall too! August 2014 We got new dresses for the girls and had a photo shoot before we flew to Wellington New Zealand to compete in the Pan Pacific Barbershop Competition. 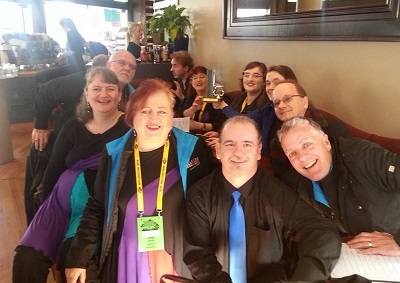 August 2014 Welington New Zeland We Won the Pan Pacific Mixed Chorus division with a score of 59.5! Well on the way to getting Mixed Barbershop Choruses into the national barbershop comps in Australia. October 2014 we teamed up with The Adelaide Sound Connection to put on a pre film Show for Magic In The Moonlight. Raising Money for our new risers. December 2014 We sang at the Hallet Cove Christmas Carols probably our bigest live audiance yet, well over 1000 people. 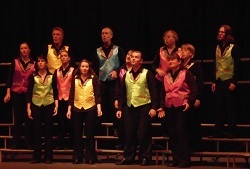 In February 2015 we sang in the BHS Central Region show Our Hearts In Harmony, a Valentines day spectacular featuring all the local barbershop choruses and quartets. In April 2015 Became proud members of Barbershop Harmony Australila again, allowing us, a Mixed Barbershop Chorus to sing at national convention in Australia for the first time In History.